I like to think I can DIY. I’ve sanded, painted, installed sinks, plumbed drains, tiled floors, and added a little burlap wreath craft to spruce up my space. But, I know my limits. I can’t fix everything. And I really am afraid of saws… 14 stitches in 8th grade shop will do that to ya). I don’t have the right equipment for every job, either. That means, sometimes I have to call in the pros. 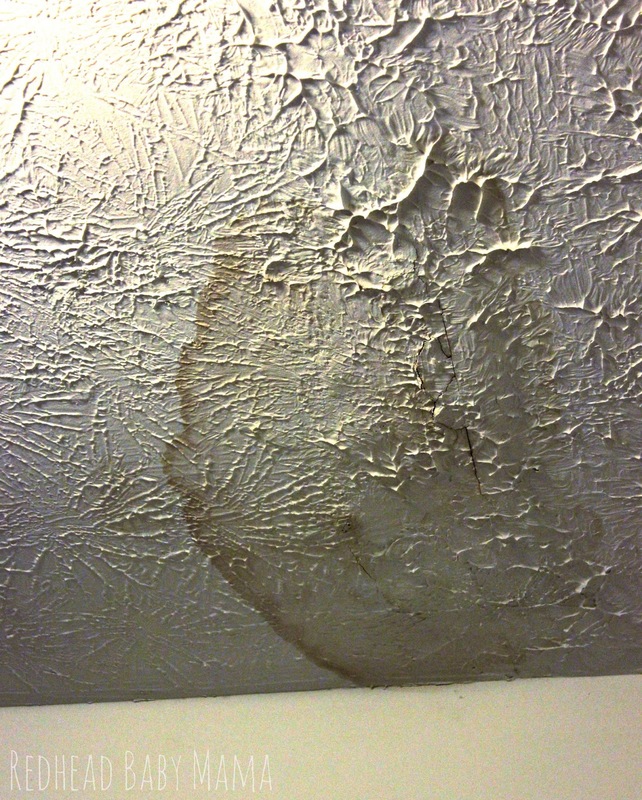 For instance, when we had our roof replaced last March, the previous hail damaged, poorly installed roof was giving us some drippy leaks. The ceiling in my closet was pretty much a hateful yellow spot, and a few lines in the master bedroom were a tell tale sign of a problem. With a toddler, a full time job or two and a working husband, time was money so we hired the neighborhood handyman. Along with lots of other little jobs around the house, he replaced the droopy sheet rock, patched the awful ceiling pattern (that I can’t wait to be rid of) and painted the whole closet and bedroom ceiling. Now, I was under the impression that the ceiling was white. The impression, I tell you. When I bought the two cans of white paint, I didn’t think it would look different. Like, at all. And I couldn’t have been more wrong. For your viewing pleasure, please enjoy this mid-post picture of the official-handyman-observing Doo. Have paint tarp, will lay and nap. Fortunately, Handyman Mario was a champ and let Dooley follow him around everywhere. Ok, seriously, here’s the new color…. WHITE. The room looks bigger, brighter, and I am oh-so-happy with the results. I wish I had a side by side photo to show you of the paint difference, but working in a blue room with two different kinds of light was not helping, and I just couldn’t get a good image… I was so enthralled with his perfect paint job, not having to move furniture (and the fact that he got the fence power-washed in the same day) that I hired him on the spot for some other jobs we didn’t have the right tools for. Future jobs I might need help with? Digging a giant hole for a new tree and replacing some sheet rock. I know I’ve got all the painting and upholstery work covered by myself. What kinds of jobs do you hire help for? We bought an old Farmhouse this year and it has alot of work left to do. I totally understand! Cute dog! I agree some jobs need to be done by professionals. My hubby tries to do everything by himself – I am hoping we hire someone to put in our new wood floors – he wants to do it himself – I want to hire someone. I am the queen of paying someone else. I hate DIY projects and it’s almost always worth the money to me to have someone else do it. I come from a long line of handy-dandy DIY women. My mom grew up on a farm and my grandpa taught her just about everything. I have watched this woman rip apart a car engine like it was a simple blender in need of unscrewing and I have watched her build a house from ground up. As for me? I don’t mind most projects but I hate to do them. However, I will DIY as much as possible to save money. Sometimes it really does pay, especially when it’s something you don’t know exactly how to do. I am pretty good at DIY, but there are a few things I will always hire people for. Plumbing is one of those things. I used to do a lot of DIY. Now I hire it out more often than not. Perfect example of when to hire out. I’ve been trying to DIY my front steps but I haven’t been able to. My husband learned this the hard way when he tried to install a ceiling fan in a vaulted living room with a pregnant wife as a helper. Serious, no go. There’s definitely times where it’s just better to let the pros do it, that is for sure! 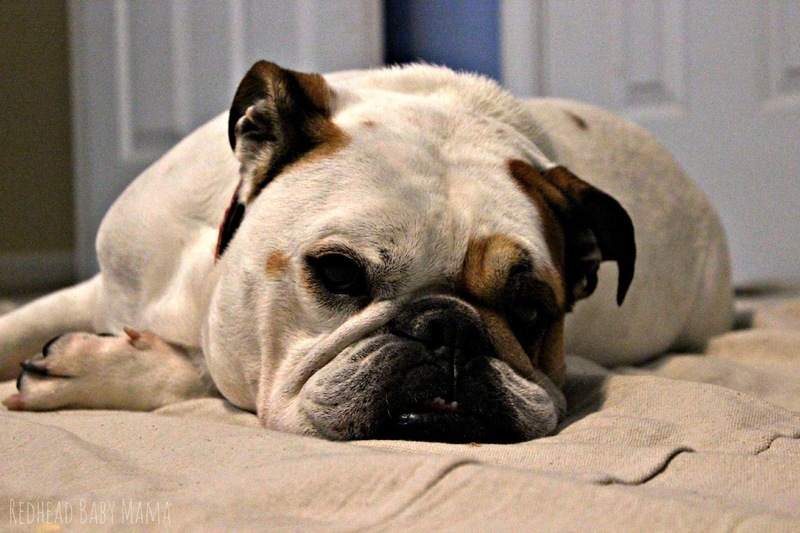 Dooley is adorable, by the way! I agree! There are some things that I won’t even attempt to do and I will hire someone. I know my limits. So glad it worked out for you! We’re not so handy and prefer to hire out for just about everything. I hire out for anything that requires more than three major steps. It’s just not worth the headache. I can’t wait to have my own place to DIY everything. I agree sometimes paying is bette The end results look great, cute dog. My mom tried to DIY her steps too, long story short a few years later no progress. I always want to try to fix or make new things, but since I have tenants living in the house I own I’m always hiring someone else to take care of any projects. This is the kind of thing my husband does for a living. Before we had children I would go to work with him and help. I remember us fixing a ceiling like yours. Glad you decided to pay someone and not DIY. I know it is so hard to decide when to spend the money to upgrade home stuff. You totally made the right decision! I definitely know my limits. I would never attempt to fix a ceiling! I agree with you! Sometimes it’s worth the money to pay someone else to do it if it means you can keep your sanity and time! It’s good to know your limits. I don’t mess with electrical stuff, anything else I’m down for. Great to know when to hire someone else. Hoping you get it fixed and I bet it will be great! We are currently considering hiring someone to clear some land and fence in our 8.7 acres of land. Well probably not all of it. We will probably leave some of it wooded. I can’t wait for winter to walk in the woods and go exploring with the kids! Wow! I wish I could gutsy like you when it comes to home DIY. Hiring people to do it would be nice but no budget yet. Absolutely right! 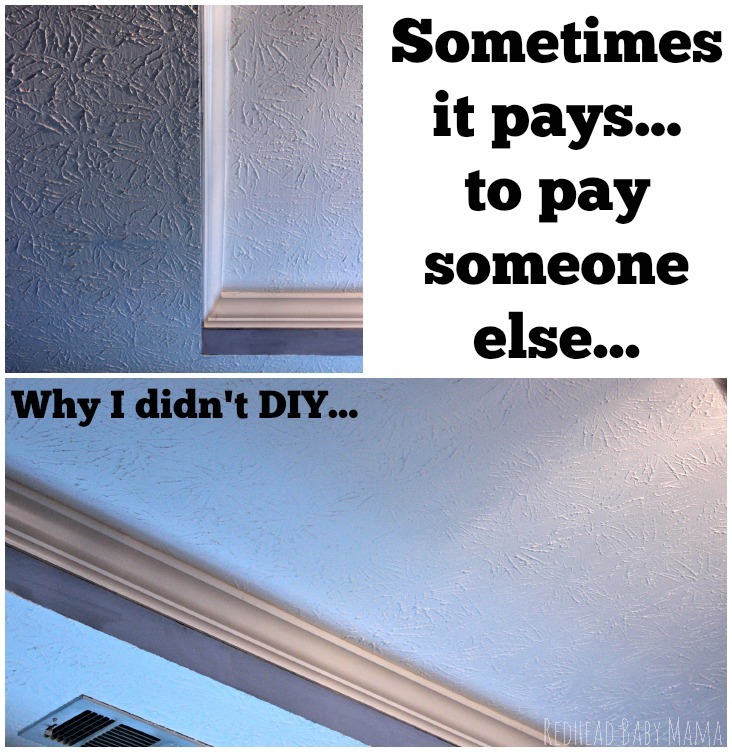 I will DIY almost everything…but some things just aren’t worth it!